An in-depth look at the work that an Australian National Rugby League (NRL) team has done with IP video technology from Newtek in order to make fan engagement about the people. Southern Cross Group Stadium is the proud home of the 2016 NRL Premiership champions the Cronulla Sharks. That means it’s often filled with spectators rooting for, and athletes competing against, the other 15 teams in the NRL. But in November 2015, the stadium found itself competing with its NRL rivals in a different arena: fan engagement. That’s when global consulting firm EY put out its Sweeney Report issue comparing the home game experience of venues across the league. And the stadium where the Sharks play, in the Sutherland Shire suburb of Sydney, Australia, came out on top. The “Shark Park,” as the team’s stadium is known to its fans, ranked highly against the rest of the NRL in a litany of stats: Best atmosphere in the NRL. Best food and beverage for value. Best for sense of occasion. Top three for pre-game and half-time entertainment. These are advantages, says the club’s head of digital Scott Maxworthy, to being the only team to own its stadium. And as part of the club’s media department, Sharks Media, he realised the greatest opportunity to attract more fans could be the fans themselves. “We try to stay at the forefront in the digital space in using technology to enhance the experience,” continues Maxworthy. That’s because the Sharks-fan conversation takes place in a variety of ways, and Sharks Media leverages all of them. “We have ‘Game Days,’ which are the days we produce home games,” he says. Game Day production involves pre-game live streaming of “The Panel Sharks PreGame Show”, sideline interviews, commentary, and interactions with the audience throughout the game. It’s a true second-screen experience, augmenting (not infringing on) the live game coverage that’s licensed exclusively by broadcasters for television rights. The club also produces a weekly SharksTV – Voice Of The Fans programme on Facebook Live, re-capping the weekend’s match and previewing upcoming contests. And throughout the week it publishes Shark Bites, short fan clips that amplify audience energy into the team’s social media feeds. In all cases, audience participation – online, on social, and in the stands – can inform both the immediate content and the overall team conversation. And, says Maxworthy, every bit of it makes a difference to the content Shark Media produces. “For example, we deliver private, non-broadcast commentary for our main game that goes to our corporate ticketholder suites,” he says. “People in those suites watch the game on the field. But instead of hearing the stadium announcer or broadcast audio, they get ‘Sharkified’ commentary.” That’s the home-team-biased, heavily attitude flavored remarks delivered as though you were hearing your buddies describe the plays (and the refs). The Sharks Media live stream production takes place in its own green screen studio. This is also located in the stadium complex, about 500 meters from where game production occurs, Maxworthy says. “Game Day big screen video is produced in the stadium using a TriCaster production system, which we tap into for our streaming show by running the signal by SDI over a long fibre run,” he says. Historically, this worked well by offering the sense of closeness to the action, but it limited their sources to the camera feed from stadium show. And the distance prevented them from having the high level of spontaneity required for maximum engagement to draw in more visitors on Game Days. “Because of broadcasting rights, we put our Game Day efforts into doing pre-game shows and things like that, which are focused on capturing that attention in that first two hours before,” Maxworthy says. Running back and forth to produce packages 500 meters away from where they were capturing the pre-game action meant long turnaround times. So long, in fact, that shooting often had to stop before there were even crowds in the stadium. Connect Spark encodes video signals from devices that use HDMI connectivity into NDI, NewTek’s software technology for video over IP. It wirelessly transmits via an IP network, allowing any other device on the same network to input the video coming from that device. This allows cameras that previously had to be tethered to a video switcher (or connected to an editing system) to instead send the video over the network, in real-time, during shooting. And it opened up a whole new workflow for the Sharks. 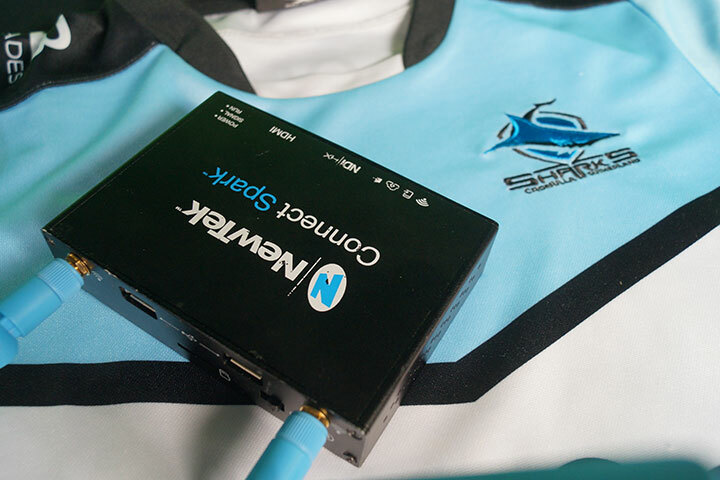 500 meters away in the production studio, NDI is helping Sharks Media’s live streaming programs expand beyond the fan-cam. Unlike the stadium vision mixer, which is a NewTek TriCaster multi-camera production system, the Sharks TV production studio uses a web streaming system from Livestream. 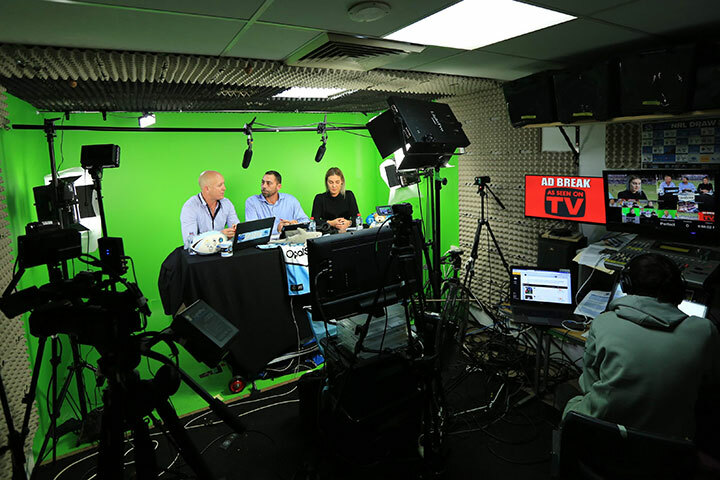 But because NDI is an open protocol – not limited to NewTek production systems – Maxworthy is able to integrate the green screen studio system into his NDI workflow as well. And using NewTek NDI Tools, any of the other computers on the production studio’s network can also become a real-time video source or output destination in the live production as well. “NDI integration gives us the ability to bring in about 30 inputs over IP,” says Maxworthy, and so far they’ve only scratched the surface. But an even bigger promise from the workflow for Maxworthy is its ability to allow participation from non-technical beginners, or emerging talent working on improving their skills. “As part of our position as a community asset, we run a not-for-profit organisation to help people on difficult learning pathways to get work experience,” he says. Since an overwhelming majority of young people can already interact with digital technology, and many with an affinity for multimedia can quickly learn visual creation software, people in the program can see their work make an impact on a show immediately. Even if it’s only a few basic TV graphics. At the other end of spontaneity are the fan experience activities that take place inside the stadium -sing-alongs, themed sections, and so on – that centre entirely on the stadium’s most important asset: the people inside it. With untethered, NDI-connected cameras enabling the crew to roam where they need to and land in those fan-focused moments at the right time, Shark Media has found an engaging way to bring more people to the stadium. At the same time, it brings the action at the stadium to more people at home. A recent Facebook Live programme attracted nearly 9,000 viewers with hundreds of fans commenting on the stream in real time.